I always knew about Swamp Thing. But never got around reading it because there was so much back story and history to the character. I will leave the history bit for some other time. The main focus of this review is Swamp Thing No. 1 to 4 from the New 52. I just did not know where to start. 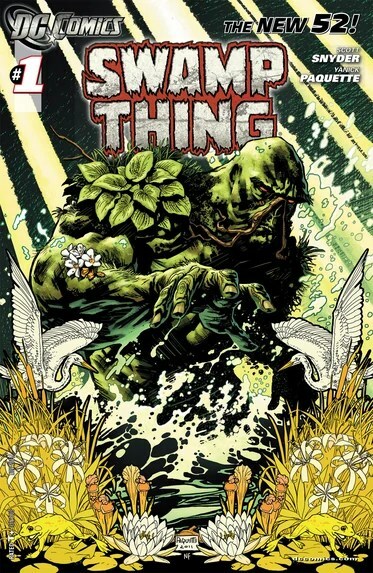 Luckily for me, the DC Relaunch came about and we have a completely new Swamp Thing from scratch written by the genius that is Scott Snyder and some brilliant and the most beautiful artwork you will ever see in a comic book by Yanick Paquette and Nathan FajrBajrn. Believe me when I say this, the art work is something to marvel at. I spent more time adoring the art than I did reading the book. Read it to believe it. Since there is a lot of backstory and history to the character, the DC Reboot series was a good place to start reading this series. And believe me, it lives up to expectations. Snyder uses metaphors to give depth to the situation and the story. The colors and the imagery is dark and depressing (in a good way). The colors of Nathan and the art of Yanick made me drool. Especially when there is a double spread. This is serious ninja level artwork! I’d pay to have this kind of artwork on a big poster and keep it in my room and stare at it for hours on end (If you don’t feel the same way, then please go read . The details are fantastic. Sometimes it goes beyond the panels and makes it look even more beautiful than Mona Lisa. Just one look at the cover and you will get an idea of how brilliant it is. Issue 1 sets out with Batman, Superman and Aquaman with their cameos when they see birds, bats and fish mysteriously dying and they contact each other and try to figure out just what is going on. Alec Holland, our protagonist, is seen living a different life of a construction worker cutting wood which he believes was once alive. He was a botanist who died in an explosion and 6 weeks later he woke up alive in a Louisiana swamp. He remembers what happened and has memories of him being the swamp thing. He is paid a visit by Superman, who tries to point out the recent mysterious deaths of animals and birds but soon realises Alan knows everything about it. The conversation between Superman and Alan is quite engaging and kept me on hook. Issue 1 lives upto being a jumping on point for a new reader who wants something totally different from the regular superhero stuff. Issue 2 starts off with a meeting from Swamp Thing to Alan and he explains the doctor how he became swampy. 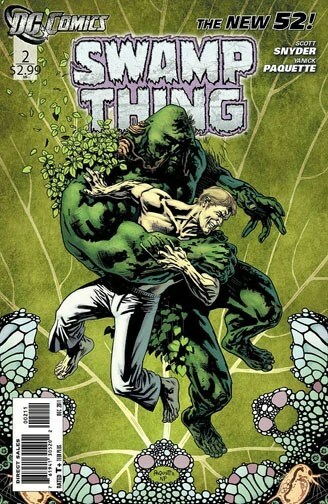 I like this issue because it really sets up the tone of Swamp Things’ background and the struggle to protect The Green and how Alan Holland is trapped in between the two. Swampy gives the doctor a history lesson on his life, The Parliament of Trees and how there are forces of nature out there who want Alan dead. I have already said what I think about the Artwork. I have nothing new to offer. It only gets better and more elaborate. I hope this is kept up with each issue. Good crisp dialogues and a fast paced story brings a new reader up to date with this creature. Go and read this series for two reasons. Incredible and mind blowing art work from Nathan and Yanick. And two, for something truly different than your superhero stories. This is one highly recommended series.